Sacred geometry involves the sacred patterns used in the design of everything in our reality, most often seen in sacred architecture and sacred art. Geometry and mathematical ratios, harmonics and proportion are also found in music, light and cosmology. The Flower of Life contains Metatron’s Cube and, within it, all five Platonic Solids. The Flower of Life is a geometrical figure composed of evenly-spaced overlapping circles, arranged so that they form a flower-like pattern with a six-fold symmetry like a hexagon. The inner circles are surrounded by two outer circles. The Temple of Osiris at Abydos, Egypt, contains the oldest example of The Flower of Life found to date, and it appears to have been ‘laser-burned’ into granite. The Flower of Life pattern contains the basis of Metatron's Cube, and from this pattern all five of the Platonic solids can be derived. The Flower of Life is a ‘female’ shape – all the lines are curved. By joining together with straight lines the centres of the flowers in the Flower of Life, the equivalent angular ‘male’ shape is achieved. This shape contains all the Platonic Solids, including the two tetrahedrons which form the Star Tetrahedron, and each of these shapes fits inside a sphere with its points touching the inside of the sphere. form,but hidden within itself it contains the form of the tetrahedron based on Divine equilibrium. What might be the volume of that small pyramidal cross-section, relative to the volume of the entire cube itself? After some lengthy calculations, using trigonometry in three dimensions, we find that the answer is one-sixth. As if to confirm that answer, the crop artist drew a long tube of square cross-section around the entire pyramid and cube at Horton, then divided it into six equal parts (see crop circle image on the upper left). These two tetrahedrons – the star tetrahedron (also known as the merkaba vehicle of light) – represent the innermost law of the physical world: the inseparable relationship between the two complementary halves – the positive/active/male/electric and negative/passive/female/magnetic, the manifest and the unmanifest – which form a perfect equilibrium. In creation they rule as two opposite laws: the law of spirit and the law of matter. After fertilisation occurs in a living being, the fertilised egg divides to form two cells, then the cells divide again, going from two to four in a binary sequence - 1, 2, 4, 8, 16, etc. The first four cells form a tetrahedron in a sphere and the apex of this tetrahedron points either to the north pole or the south pole, which probably determines the gender. Next, the cells divide into eight; they now form one tetrahedron facing up and one tetrahedron facing down; a star tetrahedron in a sphere. This is called the Egg of Life. Every single life on Earth must pass through the Egg of Life stage. Science has recognized that this particular stage of development is different from any other, and it has many unique qualities that don’t occur at any other time in its development. The most important quality of these original eight cells is that they appear to be identical - there appear to be no differences in them at all. Researchers have tried to find differences, but they couldn’t. Scientists have found that they can split the egg of life in two at this point, with four cells in one part and four in the other, and two identical people - or rabbits, or dogs, or anything else - would be created. They’ve gone as far as dividing it once more, making four identical life forms. These cells are centered in the precise geometric centre of your body, which is slightly above the perineum. There’s a little piece of skin there, and even though there’s not a physical opening, there is actually an energetic opening. That’s where the central tube runs through your body, coming out through the crown chakra at the top of your head. The Star Tetrahedron models the energetic body of the human being, the blending of Heaven and Earth, Male and Female, and was known in the esoteric knowledge of Ancient Egypt as the ‘Mer-Ka-Ba*’. The two tetrahedrons contained within each other represent the two poles of creation in complete equilibrium; spirit and matter. All of creation is based on this divine equilibrium, whether the form concerned is considered to be inanimate matter or a living creature. It is the inner law operating through all forms. Whether a given form is that of a plant, an animal or a human, the body of each of these is subject to the laws of the three-dimensional world. Hidden and invisible within this body, however, is the higher, Divine Self – Life – Eternal Being! There is only one creature which is able consciously to combine the two laws: man. He is the connecting link between the world of the spirit and that of matter. He is able to live at one and the same time by the laws of both worlds. His thoughts, words and deeds can be an act of giving, radiating selflessness and universal love. On the other hand, his body belongs to the material world and lives by the laws of matter. Only man is able to manifest his higher Self – that is, God – through his thoughts, words and deeds, when he identifies his consciousness not with his body, but with its spiritual content, with his Self. As long as a person identifies himself only with his body he is like an opaque cube, in that he reveals only the characteristics of matter, crowding the Divine creative principle into a latent, unmanifested state. No-one suspects that the tetrahedron – the Divine Self – is dwelling within. As the primordial form of matter, the cube, is built up around the Divine tetrahedron, man too, in his inner being, has contact with the Divine Self. That is why he can only find his own Divine being within himself, never by directing his attention towards the outside world. The most common arrangement of the Water molecule is in the geometric shape of the Tetrahedron. The molecule of Silicon is also in this geometric shape and, although it is currently Water that gives us life, Silicon can also support life. But what is most interesting is that the Star Tetrahedron is the geometric shape of a Silicon micro-­computer chip. As we move toward 2012, the molecules of our cells are being alchemically shifted into those of multi-dimensional Silicon. The Star Tetrahedron is the electric balance to magnetism. This is how data is stored so efficiently within a computer. It is this geometric shape that provides for memory. And the word memory takes its origins from the ancient Hebrew words mem, which means Water and ohr, which means Spirit. No one can enter the kingdom of God unless he is born of Water and the Spirit…. At a certain and specific moment (not necessarily in this lifetime), a person's Mer-Ka-Ba field can become alive. When this happens, an electro-magnetic change occurs which results in a disc of energy that comes out from a tiny place near the base of the spine and quickly expands to a diameter of 50 to 60 feet around the body. This disc can easily be perceived by scientific means, and if the United States Air Force is correct it can be seen on their computer screens via satellite. In other words, the military can see people who activate their Mer-Ka-Bas, and can watch as they move around the surface of the Earth. Since the number of people who have done this is now in the millions, it is a fairly common sight. It is the enormous magnetic burst that results from the disc expanding that brings attention to itself. The remembering of the Mer-Ka-Ba is unfolding all over the world. This unfoldment is all part of the evolving cosmic DNA. The Mer-Ka-Ba is being remembered now because this is the time to remember. Most of the ancient civilizations believed that there are specific moments in the history of mankind when great jumps in human understanding take place, as in the ancient Sumerian and Egyptian civilizations. It may be that we have arrived at another one of these grand moments of human history where brilliant light expands around the world and another huge leap occurs in human consciousness. It is possible that the Mer-Ka-Ba is a doorway or a dimensional window into a higher level of consciousness that could be the catalyst for this great change called ‘ascension’. The Merkaba is alive; it is a living field, not a purely mechanical field of energy. Because it is a living field, it responds to human thought and feeling, which is the way to connect to the field. So the ‘computer’ that guides the Merkaba is the human mind and heart. The possibilities are endless. The Star Tetrahedron/Merkaba is an amazing and powerful tool, especially during these current times of shifts and transitions. It can assist in the connection between the physical and ethereal bodies, allow us to see the psychological patterns and programs that may limit us, and is a constant reminder to remember our true, loving and Divine nature. By meditating on the Merkaba we are able to merge with Source, the Divine, All That Is. The Star Tetrahedron, better known as the Merkaba, is comprised of 2 opposing tetrahedrons that are spinning in opposite directions. In ancient Egypt the word Merkaba referred to a rotating light that would take the spirit and the body from one world into another. In Hebrew it means chariot of God. In the bible it is the way Elijah ascended into Heaven. The word Merkaba means the spirit/body surrounded by counter-rotating fields of light, and is considered to be a light vehicle for space/time/dimensional travel. It is the vehicle of Ascension designed to transition you to light body; to assist in the attainment of higher levels of conscious awareness; and to travel or transition between dimensions and realities. Once activated, this shape creates an energy field that spreads out in a saucer shape about 55 feet wide. This energy field is capable of carrying one’s consciousness directly to higher dimensions. Hence at these latitudes we find the massive volcanoes on Mars, the great red spot of Jupiter, two volcanoes on Venus, a dark spot on Neptune, dark cloud bands on Saturn, sun spots on the sun, and the volcanoes of Hawaii. The Star Tetrahedral form of the Merkaba is an immense science that is being studied everywhere throughout the world. This (saucer shape) [composite] image of [the centre of] our galaxy, the Milky Way Galaxy, was taken with NASA's Cosmic Background Explorer's (COBE) Diffuse Infrared Background Experiment (DIRBE). This never-before-seen view shows the Milky Way from an edge-on perspective with the galactic north pole at the top, the south pole at the bottom and the galactic centre at the centre. Some of you have heard about the Merkabah. And you might say, “What is this thing we call the Merkabah?” Now, this is your word; it is not ours. But suffice to say that what we are speaking of is what we call the ‘energy shell’. It is that which holds your entire energy together. It is like the skin of your entity, but oh, it’s so much more. You have only seen the Merkabah in history a few times. You are starting to see it more now, and confusing it with ships from space. For it was Elijah who claimed his Merkabah in the field; it glowed, and you saw the wheels within the wheels. You saw the colours, and you saw the magnificence when he ascended. This was the Merkabah that was seen. Each one of you, when you are not here, has a glorious look to you, with colours and vibrations and sounds and shapes all intertwined in the Merkabah, things which you could not possibly see or hear with your biology now For there is so much dimension to the Merkabah, I cannot begin to tell you what it contains. Now, in the past we have told you that the Merkabah has your colour stripes, those things which tell the other entities of the universe, when they meet you, where you have been and what you have done. And we have told you about the great hall of honour where you received the new colours for being a human on the planet Earth. For it is a wonderful journey that you take. All of you sitting here this night (and reading this) have many stripes from being here so many times. And the great irony is that, although you would come into this room only one time and see these faces of those whom you pretend not to know, at one time they were all your relatives! They are part of your karmic group – brothers, sisters, mothers, fathers: so much has happened between you, and yet you pass as strangers. It is such a wonderful testament to the veil that is here keeping you from seeing the truth, for to truly know these things would cause you to leave. Oh, dear ones, we honour you for this! Walking the planet in lesson with this veil of not knowing who you are. As we look at you and say to those around us, “They volunteered for this”, we love you dearly for it. And so it is that the Merkabah shouts a language that all entities hear, see, feel and experience. So the Merkabah is not just your shell, dear ones; it is your language as well. The Merkabah is the energy which allows you to move from place to place. When you move from one place in the universe to another, it is almost instant, but your Merkabah changes shape to do it. And although we will not get into the science of this, we tell you that it has been channelled before. Look for it, for your Merkabah therefore, is a shape shifter! The shapes that are present in the Merkabah are pure – total – science. And this, dear ones, is a great humorous irony: that your society has chosen to separate the spiritual from the physical, and from the ones who work on your mathematics, and the ones who work on your geometry and your physics. 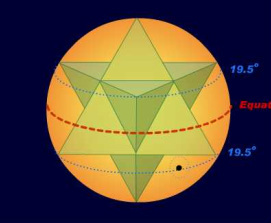 If you could see the Merkabah, you would understand totally that the relationship is complete and married, for the Merkabah is made of geometry, and it shouts to you your base-12 system. It says that all the shapes are mathematically divisible by six, that there is purpose for this – and yet you still have not seen it. And so we speak of the Merkabah as something grand and glorious. It is owned by you and each one of you has it. But it will not appear on this planet, for to have it would vaporize your biology. The energy is simply too great. And so, short of claiming the Merkabah, you can still work on it, for it still exists in the astral. Part of the steps of being in ascension are to work on it and marry it into your biology. The Merkabah carries its own light; wherever the Merkabah is, there is light. This makes you creatures of light! Accept it. And finally, here are a few words on the source of the word 'Merkabah' very kindly supplied by one of my readers, Itai, whose background is in Hebrew Scripture - thank you, Itai. The Egyptian words Mer, Ka, and Ba, by some manner of laws not yet understood, align with the already existing word merkavah in Hebrew, meaning “chariot.” One might ask, “Wouldn’t these come from a shared older language?” Merkabah or merkavah does mean chariot in Sumerian and Akkadian, and there are similar words in the other languages of the region. (The “v” and “b” sounds are the same letter.) However, this etymology is not related to the Egyptian words Mer, Ka, and Ba because of the way that the words are formed in Hebrew and Akkadian. Merkavah comes from the word root made up of the sounds “r,” “kh” or “k,” (also the same letter,) and “b” or “v.” Words with that combination refer to riding, or a vehicle. The Merkavah, as mentioned, came from Ezekiel’s vision – the one with the wheels within wheels. Whether or not having this vision equates to ascending Heavenwards is something that I will leave for you to interpret, but it was Enoch, not Ezekiel, whom the Tanakh explicitly says ascended. In Genesis, “he walked and then was not, for he was with G!d.” The Hebrew book of Enoch, or 3 Enoch, likely post-second Temple (it includes words in Greek and Latin), has the earliest recorded mention of Metatron. Metatron was the name given to Enoch after his ascension. Merkavah mysticism, a precursor of Kabbalah, which with abundant gratitude is a living tradition to this day, is based on this ascension. In conclusion, Merkabah may very well be the most appropriate name for what we are describing, no matter what its source. However, one who wishes to be closer to the source of Merkabah wisdom still needs to know where to look. And so, the primary documents for the Merkava of Ezekiel’s vision as a vehicle for ascension, and the ascension of Metatron, are the Hekhalot literature. These are pre-Kabbalah Jewish mystical texts. Primary texts for Mer, Ka, and Ba are outside of my realm, as my background is in Hebrew Scripture. Mer-Ka-Ba and the Ezekiel’s Merkavah are historically unrelated. The latter could not have been based on the former because of the difference in the way the languages work, and the former could not have been based on the latter because it happened earlier. But that is not to say that there is not a good reason for Merkavah and Mer-Ka-Ba to overlap in this moment.